Lower birth rates and higher life expectancy is transforming the shape of the UK population, with the proportion of those of a working age shrinking whilst those of a pensionable age is increasing. 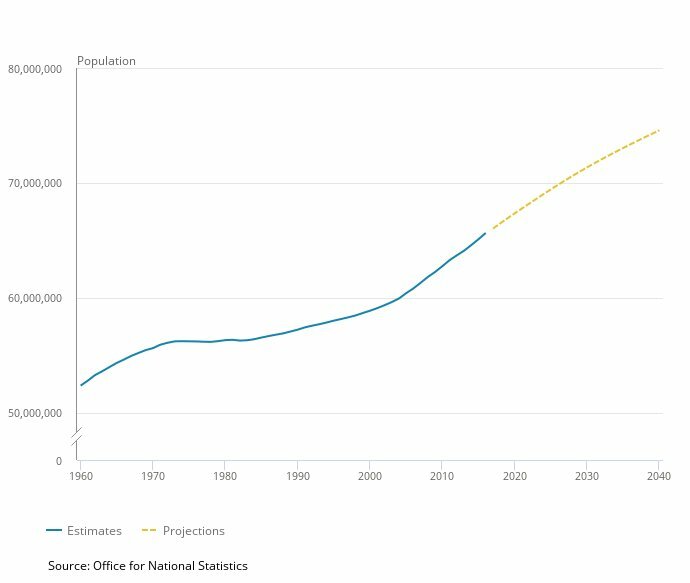 Here we highlight how the UK population has changed, what has caused it to change and how it is projected to change in the future. In 2016 the population of the UK reached it’s largest ever, at 65.6 million. This is a rise of 538,000 on 2015 and equivalent to a city the size of Bradford. In fact the rate of the population growth has increased so significantly over the past 11 years that it has grown by over five million, when previously it took 35 years from 1970 to 2005 to make the same leap. The chart shows the relatively high population growth during the ‘baby boom’ of the 1960’s, followed by slower growth in the 1970’s. The population began to grow again in the late 1980’s when the 1960s ‘baby boomers’ were having children, echoing earlier growth. More recent uplifts in population growth have generally coincided with an increase in the number of countries holding EU membership. Natural change is the difference between births and deaths. Over the past 60 years the number of births in the UK has been greater than the number of deaths, accounting for 35.8% of the population growth. 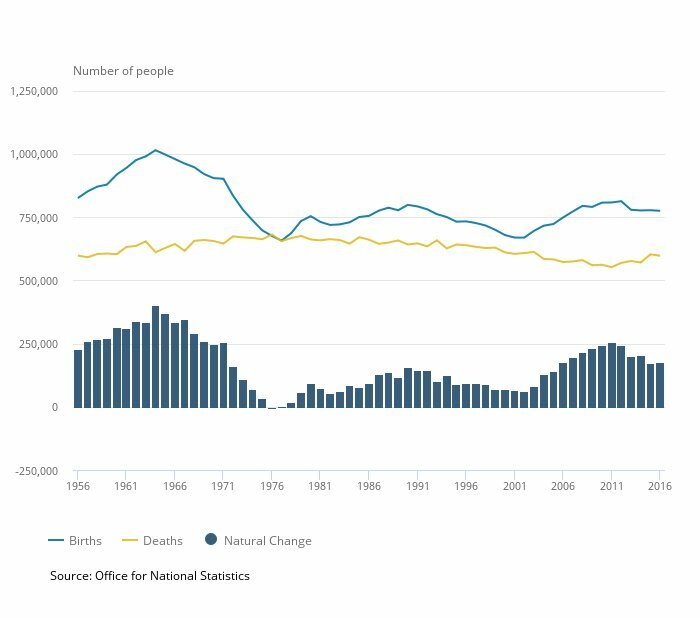 After the baby boom in the 1960s and the “echo” of baby boomers having children, births in the UK began to stabilise and have generally been between 700,000 and 800,000 since the mid 1970s. The most recent peak was in 2012 when births reached 813,000, the highest since 1990. The long-term trend in the number of deaths is more stable than the number of births, peaking in 1976 at 681,000 (the only year since 1955 when deaths outnumbered births) before steadily declining until 2011. This decline is because people are living longer. More recently deaths began to slightly rise again, until 2016 when deaths decreased to 597,000. The main driver of the growing UK population, particularly since the 1990s, is net migration, which accounts for 62.4% of the population growth. Defined as the number of immigrants (people moving to the UK for more than 12 months) minus the number of emigrants (people leaving the UK for more than 12 months), the direct effect of net migration has increased the population by more than 251,000 people on average per year from 2004 to 2016. This equates to an average of 52,000 more people per year than natural change for the same period . In addition to this direct effect of migration on the size of the population, current and past international migration also has indirect effects on the size of the population as it changes the numbers of births and deaths in the UK. Immigration has been higher than emigration since the early 1990s. 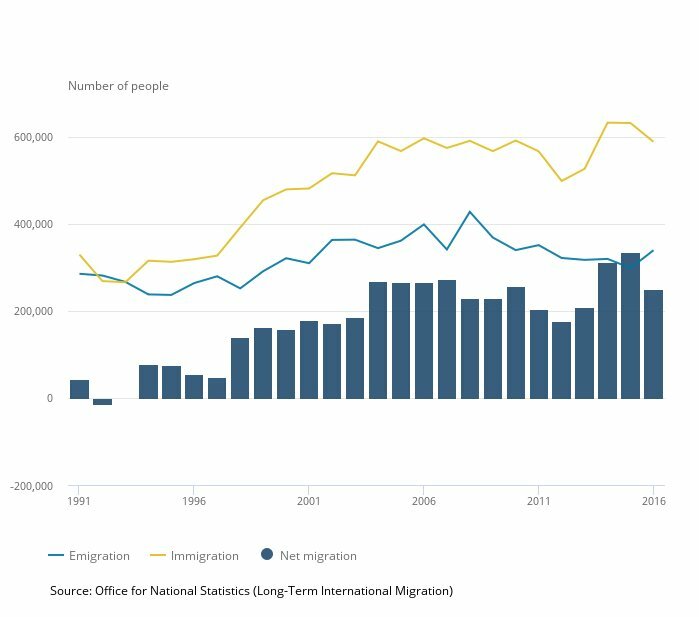 Rises in immigration have tended to coincide with the expansion of the EU, allowing more people to freely migrate to the UK. In 2015, levels of immigration (631,000) were more than double those of emigration (298,000). The highest immigration levels to date were seen in 2014 with 632,000 people coming to the UK. Immigration has fallen with provisional data for the year ending 2016 (which included 6 months of data following the EU referendum) showing immigration dropped to 588,000, while emigration increased to 339,000. Migrants tend to be aged 20 to 36 years, an age when people are likely to be working. As the population is growing, improvements in healthcare and lifestyles mean the population is getting older, with 18% aged 65 and over and 2.4% aged 85 and over. The old age dependency ratio (OADR) has been increasing since 1996 and is projected to keep rising. This ratio is the number of people over 65 years old for every 1,000 people aged between 16 and 64 years old, and is a useful measure to understand how the balance in the population will change, particularly when planning for the needs of the different age groups. In mid-2016 the UK’s OADR was 285. The table below from the Office of National Statistics shows how the population is changing for different age groups; children (aged 0 to 15 years), people who are most likely to be working (aged 16 to 64 years) and people most likely to be retired (aged 65 and over). Life expectancy over the last few decades has been steadily increasing. Females born in 2015 can expect to live 82.8 years from birth, 4 years more than females born in 1991. Males have seen a greater increase in life expectancy of 5.7 years, from 73.4 years for males born in 1991 to 79.1 years for males born in 2015. The increase in life expectancy in the UK is projected to continue, with life expectancy at birth for females projected to be 85.1 years by 2026 and 86.6 years by 2036. Males are also projected to live longer, increasing to 82.1 years by 2026 and 83.7 years by 2036. There are a larger number of people in their mid-40s to mid-50s due the effects of the 1960s baby boom and the children of the baby boomers can be seen in the higher number of people in their 20s. The population by age was broadly similar for males and females in both 2006 and 2016. However at older ages women outnumber men and this is particularly evident in those aged 80 and over.